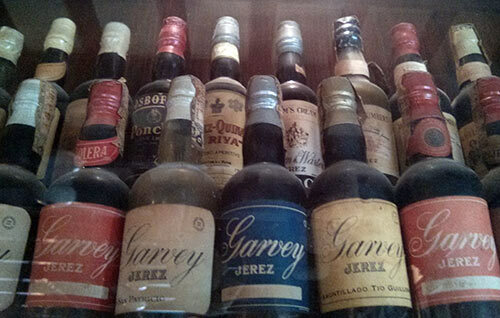 Sherry is one of those drinks that is largely misunderstood as most people believe it to be a sweet drink when in reality, the majority of it is dry or more to the point, not sweet. Unlike regular wine which most people know as red, white, rosé, or sparkling, Sherry has a a myriad of different names, but let’s break it down to its most basic components in that it’s either “dry” or sweet” while avoiding the blends which are a best unto themselves. If you haven’t tried dry Sherry, it is pretty damned fantastic. It will pair with just about any meal you want to have it with. You can sip on it seemingly all day and despite the decently high alcohol to it (typically between 15-20% ABV), it won’t drag you down. You’ll see it on the table in any tapas bar around Andalusia. Oh, stressed to find that perfect wine for Thanksgiving in the US or Canada? Pick up a bottle of dry Sherry and well, you’re done. So why is it so hard to remember this? Mostly because there are a number of names for dry Sherry including: Fino, Manzanilla, Amontillado, Palo Cortado, Oloroso. There are a number of differences between these, but if you want to get the most basic and easy to find Sherry, pick up Fino or Manzanilla and like Thanksgiving meal pairing, you’re done. If you don’t want to remember all of that, then maybe it’s easier to remember which are the sweet Sherries if you don’t want those and those fall under the names Pedro Ximénez, and Moscatel–the latter of which is sweet all over Spain. Likewise, if you want a sweet Sherry as my grandmother does indeed love (and thus why it has such a stuffy image) remember these names. If you see Cream, Medium, or Pale Cream, these are all blends of dry and sweet Sherries and well, try them if you like to see how they strike you. This is a massive simplification of Sherry as the sub types of the dry variant are quite different from one another, have very long aged variants, and vary a great deal from town to town in the “Sherry Triangle” where they’re traditionally made comprised of Jerez, Sanlúcar de Barrameda, and El Puerto de Santa María. If you want the quick, free overview, head to the almighty Wikipedia entry or the Denomination of Origin website. You’ll probably come back to where I’m at in that remembering what’s sweet is easiest and I typically avoid these as I find them to be insanely sweet and overtly potent. These sweets, and moreover, the blends were created for the British export market originally which again contributed a great deal to the stuffiness image of the drink. If you really want to dig in to the drink more, pick up Sherry, Manzanilla and Montilla by Peter Liem and Jesús Barquín which has been one of the more insightful guides to come out about the region in a long time. You can also check out Sherry by Julian Jeffs which is a much older book although it’s in its 6th edition now and engenders a grand following as it’s been around for so long and has long been the go-to guide for the wine and the region. Lastly there’s Sherry Talia Baiocchi which just came out a couple of months ago. It isn’t nearly as in depth as the other two though and mostly focuses on being a hip, good looking book with a strong emphasis on cocktail made with Sherry which makes the grand, overarching title a bit misleading. Of course, you can simply say, “Screw you books, stop your teaching me things!” and just start drinking Sherry. The price, even on the export market is incredibly easy to swallow at the moment and you’ll most likely not find a bottle you dislike and some that you like a great day. Can’t say I’ve ever heard of it either. Would be curious if it was a dry or blended Sherry but I’d assume the former with gumbo.